It’s been a while since I’ve posted anything new. I made a pact with myself that I wouldn’t get distracted with my blog until I finished Chapter 9. As it happens, I have also finished Chapters 10 and 11 and I’ve only got one chapter to go before I’m halfway there. Exciting and depressing at the same time. As you can see, there are a few problematic chapters, most notably Chapters 6 & 8. One is way too long and the other way too short. I had a few issues with the transition between 8 & 9 that I will have to go back and fix during editing. Revision now would be a bad bad idea. Even being a perfectionist I know going back to do re-writes now will set my time line back big time. Better to wait. Anyhow, the upshot is I’m getting somewhere and if I can keep up the pace, I should have a completed manuscript ready for revision by Christmas. This is my hope anyhow. I have to say that Amazon is really pulling out all the stops to dominate the e-book market. 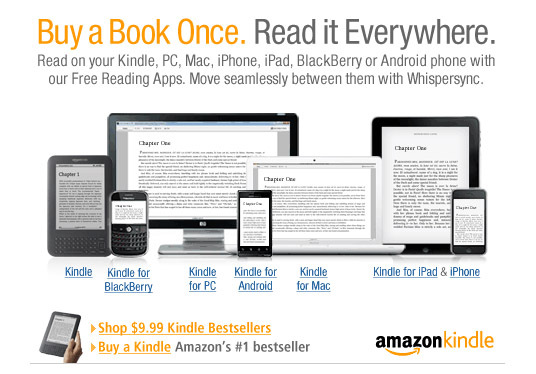 I had no idea that the kindle software was as cross-platform as it is. Interesting that it’s up on the iPad as well as other mobile devices. They certainly are not throwing any punches, it’s more like KO power. Dominating as many platforms as possible is a very savvy move while others try to catch up in the race. I wouldn’t like to say who’s going to come out on top, but Amazon’s not taking no for an answer. Stay tuned to this space. I’m sure it won’t be the last time that Amazon comes up on my blog.